While living in Denver in 1983, I was offered a position with the US Department of Energy as a Chemical Operator. However, I had to first go through a top security “Q Clearance” with the US government which would take a year to complete. While waiting for clearance, I saw an opportunity to do something I always wanted; get my real estate license. While spending time in Breckenridge, Colorado, I attended real estate school and obtained my license. 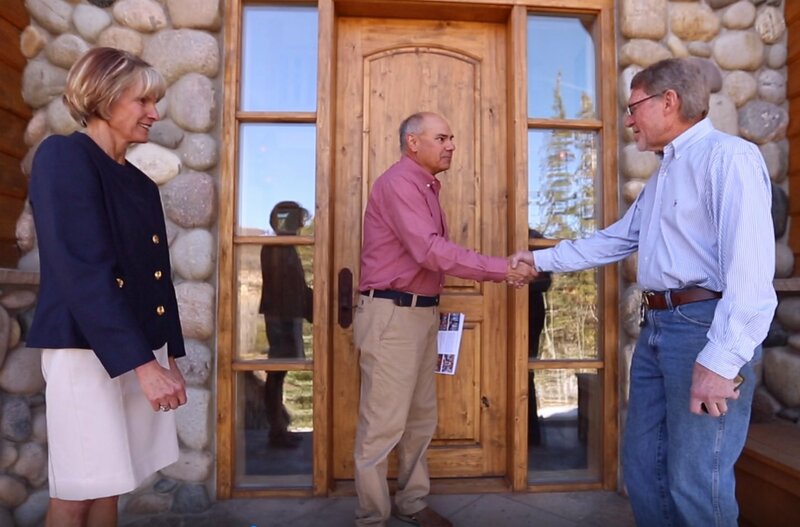 My plan was to work the Summit County real estate market, and once the clearance was completed, move back to the Denver area to start working for the DOE, and engage in real estate part time. I held three jobs in Summit County while obtaining my real estate license, and six months into the security clearance period, I received notice that the DOE was closing the plant where I was hired to work. I was only slightly disappointed, as I was enjoying living and working in the Rocky Mountains. Fortunately, my entrance into the Summit County real estate market had already convinced me of my desire to succeed in this field and live in the mountains. This eventually led me to holding executive-level positions for some of the largest resort operators in North America, including positions as Director of Real Estate for Copper Mountain (CO) and Hidden Valley (PA), Vice President for The Big Mountain Resort (MT) and Director of Real Estate for American Skiing Company's Steamboat operations. With these positions I gained a great deal of knowledge in many aspects of the industry and responsible for over $500,000,000 in real estate transactions as well as in developing, designing and marketing a myriad of single family, town home, condominium, timeshare and land developments. In 2000 I opened Buyer’s Resource Real Estate of Steamboat. For 15 years my practice specialized in buyer representation. This was quite a departure from my prior positions where I primarily represented properties owned and developed by the ski areas as their listing broker. However, I saw a need in the market for exclusive buyer advocacy. In the 15 years I owned Buyer’s Resource, Colorado real estate law evolved, and consumer protection for buyers was on an equal level as sellers (in part from the efforts of exclusive buyer agents). I had many clients over those years ask for assistance in listing their property, but as an exclusive buyer broker I could not. So, in 2015 I looked at options to enter the traditional brokerage trade. After carefully considering several offers I saw Steamboat Sotheby’s International Realty as the best choice. They had a strong local presence from excellent leadership and professional agents, and the Sotheby’s brand is recognized as the premier brokerage in the world. Their support to each individual agent is remarkable. This helps me do the best job for my clients. I am the only Steamboat Springs REALTOR to receive both, the REALTOR of the Year and Best of the Boat twice. I have been fortunate to have lived in some of the most beautiful mountain locations in the US, but decided to settle in one of the most beautiful communities; Steamboat Springs. My family feels very fortunate living in this town since 1997 and proud to be counted among its many wonderful people who look out for each other in every sense. This genuine nature of this town and its people make it easy to give back, and we have enjoyed doing so. With each one of my closings, the Yampa Valley Community Foundation receives a monetary contribution. We also donate time and money to various humanitarian, religious, scholastic and athletic efforts. Originally from Grove City, PA, I graduated from Slippery Rock University (PA) with a Bachelor of Arts degree in Geography and a concentration in Rural and Urban Planning. While attending SRU I was elected captain of my college football team. I was also a nationally ranked javelin thrower. My wife, Mary, also works with me at Sotheby's. We have three children; Kelly (1987), Nick (1989) and Madeline (1997). Mary agrees that there is no better community to raise a family than Steamboat Springs. Our ‘kids’ still keep us very busy, but in my free time I enjoy playing ice hockey, skiing and golfing. In 1979 I took an introductory airplane pilot course and vowed someday to continue my dream to become a private pilot. The wait was longer than I had intended, but the passion remained, and I fulfilled that dream in 2008. One of the many blessings I have found in my chosen career are the clients I have been able to help with their real estate needs, and who have also become lifelong friends in the process. I would enjoy learning more about you and your dream of buying or selling your Steamboat Springs property I welcome your call or email to get started!